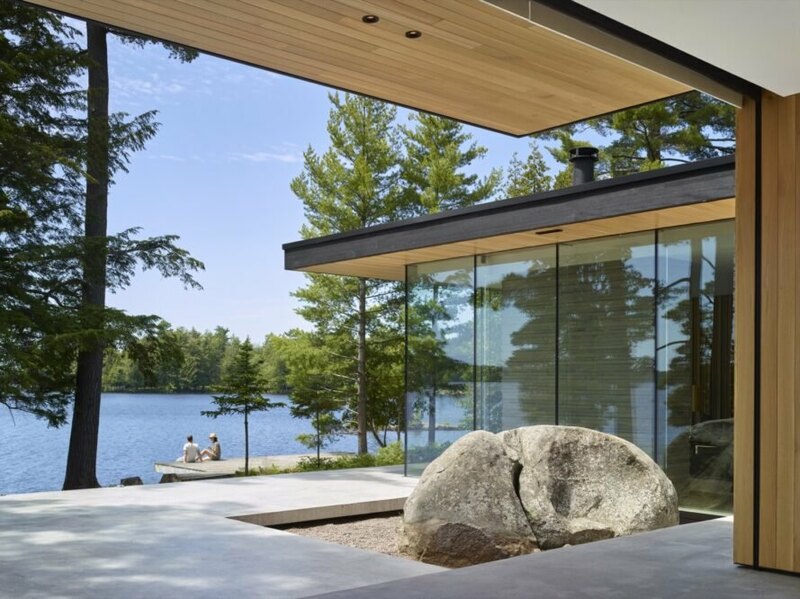 Walls of glass pull the outdoors in at the Lake Manitouwabing Residence, a new four-season family residence designed by MJMA (MacLennan Jaunkalns Miller Architects) to replace a 1930s abode. 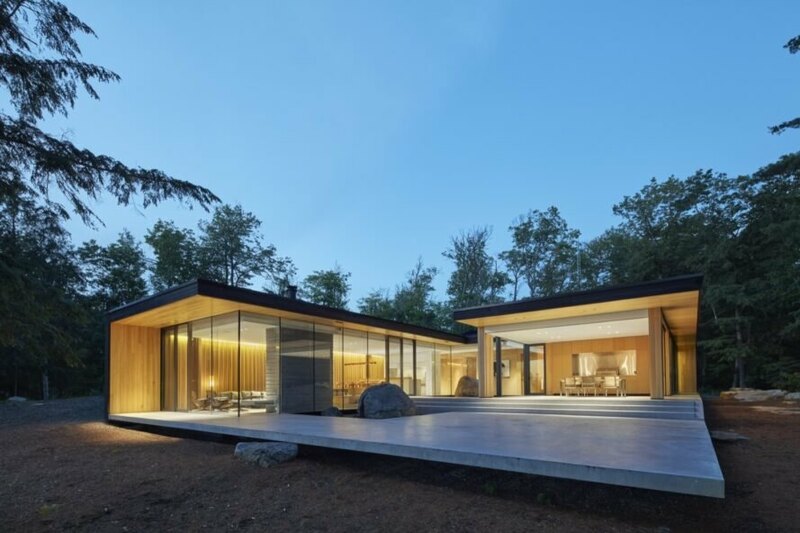 Located in the Ontario town of McKellar, the contemporary house was engineered to embrace indoor-outdoor living without compromising energy savings. 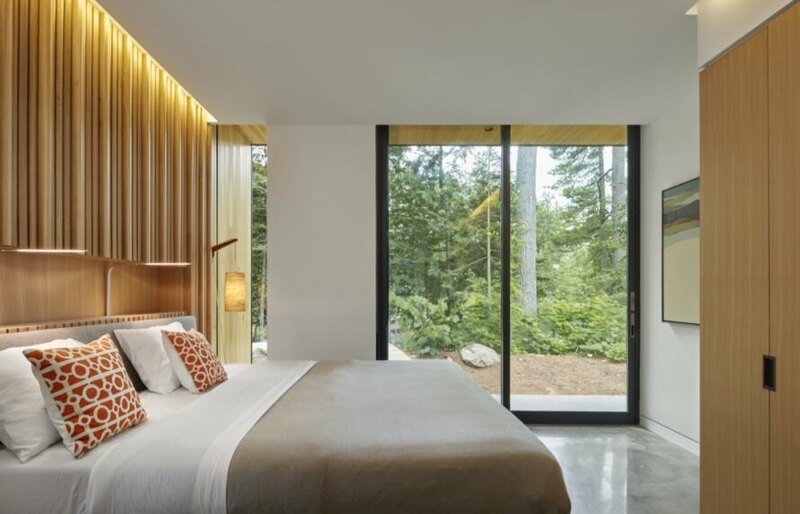 To that end, the architects designed the house to take advantage of passive heating and cooling and integrated energy-saving technologies such as concrete radiant floor heating and low-E glazing. 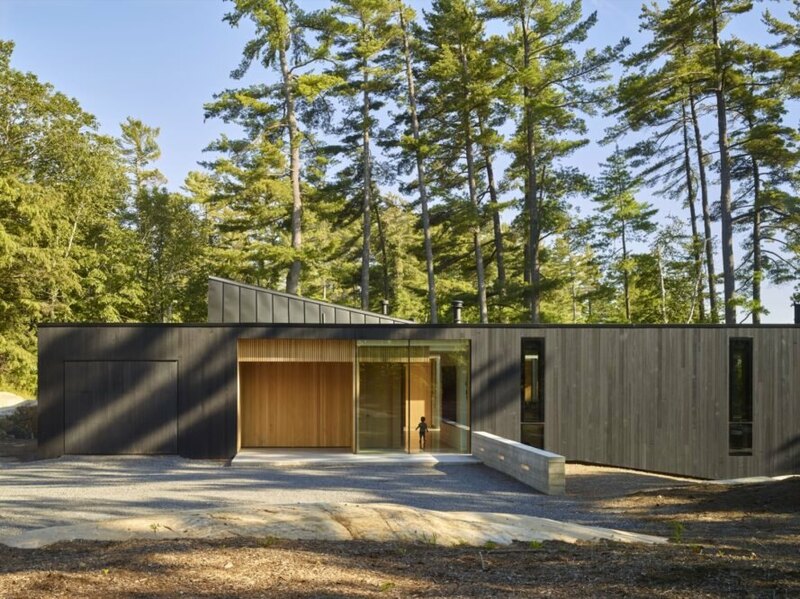 Set on a west-facing peninsula, the Lake Manitouwabing Residence blends into the pine-studded landscape with its low-lying profile, flat roofs and dark timber cladding. 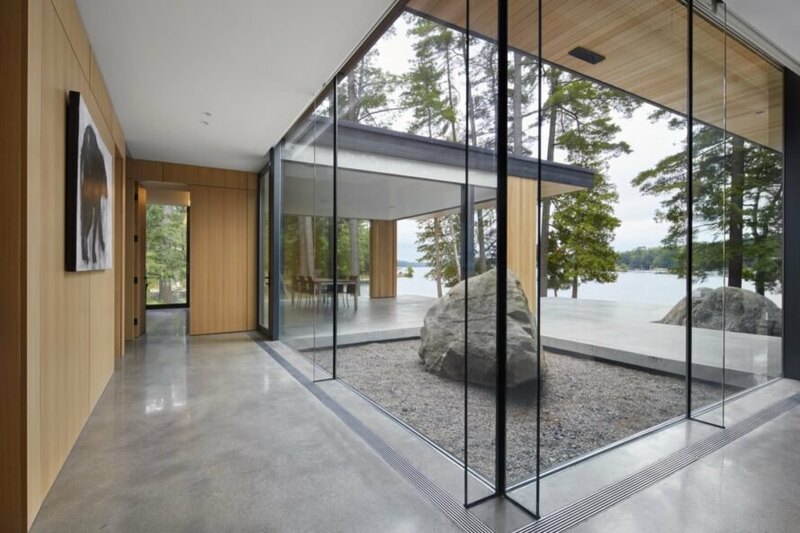 The home is oriented to the south and west for warmth, natural light and views of the lake, which are captured through full-height glazing that wraps around the living areas for fluid indoor/outdoor spaces. The expansive home covers nearly 3,000 square feet of space laid out in a U-shaped floor plan that wraps around a central courtyard punctuated by a uniquely cleft rock. Deep overhangs jut out over the walls of glass along the home’s south and west sides to mitigate unwanted solar heat gain in the summer while allowing light and warmth to come through in winter. In contrast, the north and east facades are mostly opaque and heavily insulated to protect against winds and heat loss. Low-E glazing and an R-35 roof combined with a high-efficiency boiler, HRV and convection wood stove optimize energy efficiency. MJMA designed this large family home to take in the impressive lakeside views. The home features a dark timber facade to blend the structure into its surroundings. The residence sits on a west-facing peninsula for optimal lake views. The floor plan wraps around a large rock. The house celebrates indoor-outdoor living. Views of the lake are framed by full-height glazing. Simple materials and colors keep the attention on nature. The spacious house has plenty of room to entertain guests year-round. Low-E glazing and passive solar design increase energy efficiency. The home will remain cozy and energy-efficient throughout the year.